I find that most Americans are surprised to learn that many famous British and American writers visited—and wrote about—Australia. Mark Twain wrote extensively about Australia in his book Following the Equator. The work includes information about his lecture tour and the people he met, but focuses more on what he saw and learned, both positive and negative. While Twain does not shy away from biting social commentary, the vast majority of his writing about Australia shows admiration for those who built the country and amused astonishment at Australia’s picturesque history. He also describes in often loving detail the beauty of his surroundings, as in this description of his arrival in Adelaide, South Australia. It was an excursion of an hour or two, and the charm of it could not be overstated, I think. The road wound around gaps and gorges, and offered all varieties of scenery and prospect—mountains, crags, country homes, gardens, forests—color, color, color everywhere, and the air fine and fresh, the skies blue, and not a shred of cloud to mar the downpour of brilliant sunshine. And finally the mountain gateway opened, and the immense plain lay spread out below and stretching away into dim distances on every hand, soft and delicate and dainty and beautiful. On its near edge reposed the city. And D.H. Lawrence wrote a book titled Kangaroo, which is set in Australia, the title character being a politician who is nicknamed “Kangaroo,” who ends up dead by book’s end. However, for much of the book, the only slightly fictionalized Lawrence and his wife wander about the countryside, amazed at its beauty. 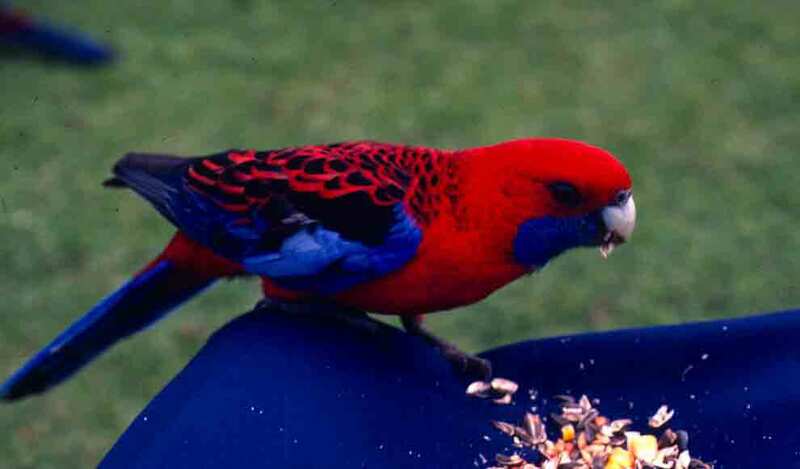 One of the lines I quote most often from this book is “That is another of the charms of Australia: the birds are not really afraid.” I found this to be true, and offer as evidence the photo below of a crimson rosella in the Queensland rainforest eating seeds out of my skirt, as I sit cross-legged on the ground. While writing was a primary goal of my first Australia trip, and has remained a major component of all my travels since that life-altering trip, I also have a great fondness for photography. When I landed in Australia, in addition to my trusty Nikon FM2, I had a fair number of lenses, a tripod, and 120 rolls of Kodachrome film. As a result, images are part of what I hope to be sharing with you on this blog. And I figured that there could hardly be anything more Australian for kicking that off than a nice koala (even though, personally, I prefer kangaroos). “Koala” is an Aboriginal word for “never drink” or “no water.” Koalas get almost all the moisture they need from the eucalypt leaves they eat. However, they do occasionally drink, but only small amounts, and only in the summer, when the leaves dry out. 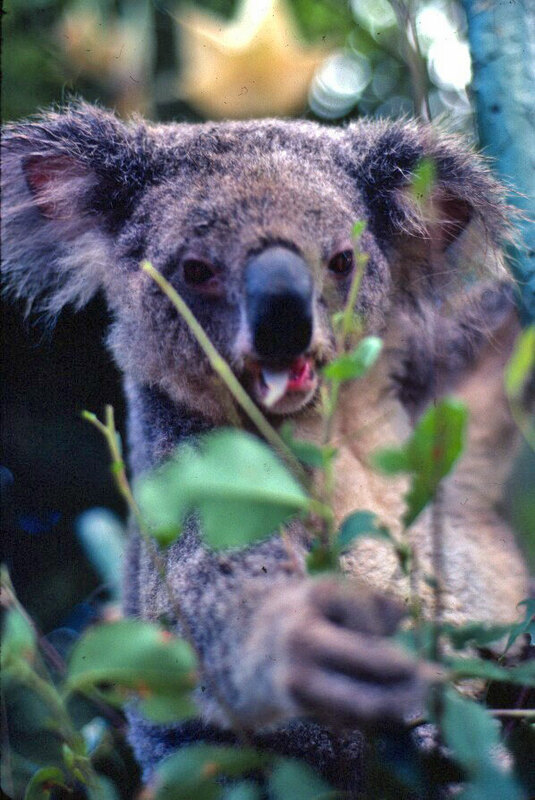 Adult koalas come in a surprising range of sizes: from 10 to 30 pounds, and two to three feet in length. They have remarkably soft fur, but their long, sharp claws make them less than ideal as cuddly toys. “Clancy of the Overflow” spoke longingly of the life of the drover (what Australians call their cowboys). At the end of the poem, the poet wonders if he wouldn’t prefer Clancy’s life on the plains to a city desk job. While I’m not a swagman, and I was usually carrying more luggage than just a Matilda, I did waltz over a substantial part of Australia during my six months, and have returned to waltz again, on three subsequent visits. From the Red Center, I traveled north, to Australia’s Top End. I was only in Darwin for a day before I headed out with a small adventure tour group to visit Kakadu National Park, and wonderful wilderness made internationally famous in the movie “Crocodile Dundee.” On our second day in Kakadu, we visited Yellow Water. Yellow Water Lagoon, with its many branches and inlets, was as still as glass when we arrived just after dawn. Reflected in the smooth, silver-blue water were the willowy paperbarks, dark-leaved mangroves, and densely clustered groves of pandanus that grow along much of the shoreline. A small, flat-bottomed, aluminum boat was tethered to a tree at the lagoon’s edge, and in this we launched out onto the bright water. Most of the salties we saw were lazing in the sun or cruising through the water lilies. We did see one, though, who’d just caught dinner—a 20-pound ox-eyed herring—and we watched as he calmly crushed his struggling prey, the sound of crunching bones echoing across the still lagoon. Then he deftly tossed the fish into the air, catching it so it would go down head first, and with one gulp it was gone. A large goanna moved cautiously into a clearing at the water’s edge. Goannas are monitor lizards, of which there are about 19 species in Australia. The largest is the giant perentie, second in size only to the related Komodo dragon. The goanna before us was no giant, but was at least four feet long. We went ashore to get a closer look, approaching slowly and quietly. The lizard’s forked tongue flicked in and out as it “tasted” the air, and it could tell something was going on. I was closest to it, and I could hear it hissing. Then it reared up, and I froze. Eventually, the goanna moved off into the brush, and we returned to our boat. Yellow Water is so called because after the rainy season the water’s surface is entirely covered with yellow water lilies. The lilies we saw were either purple or white, and clung mostly along the shore. But it is feathers, not flowers, that draw visitors to Yellow Water, for here one of the largest selections of Northern Territory birds congregates. From Alice Springs I headed, in company with a largely Australian group of campers, into the delightful wilderness of the center, where we hiked, camped, and explored. We drove to a spot about two miles from the head of Kings Canyon. Undulating, scalloped stone walls fell from the plateau above like a great, ragged, red furbelow. Hugh led us up one of the steep, broken stone pleats. A 700-foot climb brought us to the top of the canyon wall, where the scene before us was wonderful, but almost too strange to describe. Surrounding us were bizarre domes, shelves, steps, and sculptures of layered, fractured, red rock. A sea of what looked like giant, worn, red beehives, four feet to 20 feet tall, stretched into the distance. Crossing this remarkable terrain, we wound between humps and mounds, clambered up and down broken stone slabs, and crawled through a long, low cave. We explored the area known as the Lost City, which, with its domes, spires, and terraces of red rock, does look like the half-buried ruins of some Eastern citadel. On cliffs and in crevices grew lone ghost gums, graceful trees with chalk-white trunks and slender, pale, olive leaves. Twisted, weather-blasted cypress trees clung with gnarled roots to splintered shelves and inclines of rock, and ancient, feathery cycads grew lushly in the shadows and valleys. The cycads here are the rare Macrozamia macdonnellii, which may have grown in this area for as long as 200 million years. In places where the terrain was flat, the ground was dotted with the wonderful, round, golden “pillows” of spinifex grass. The leaves of spinifex are tender and green when young, but as they mature they roll up into pale “needles,” which one quickly learns to avoid. But I love the look of them—like herds of huge, golden hedgehogs. We hiked on through the weird, inspiring, rust-colored landscape. Near Aladdin’s Lamp, a four-foot-long rock sculpture balancing a few feet above our heads, we came to a rather scary but safe (we were assured), narrow bridge of flat sandstone slabs wired to tree branches, which had been dropped across a 90-foot-deep crevice. Only a few people were so daring as to stop in the middle of the bridge to pose for photographs. On the other side of the crevice, we continued on till we reached the impressive, precipitous North Wall of Kings Canyon. At the canyon’s edge, Hugh climbed a rise, then strode out onto a thin, rock shelf projecting into space. Quickly, others followed, to enjoy the unexcelled view of the canyon below and the land we had just traversed.